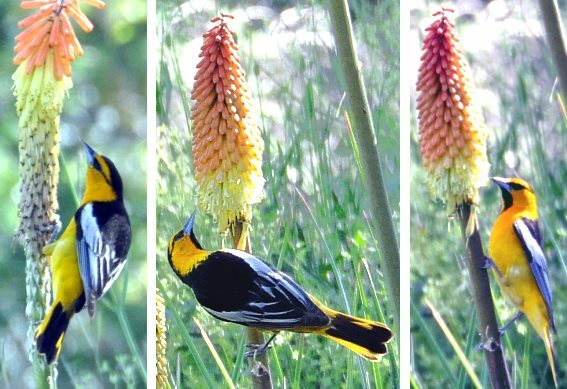 The first year these incredible birds came to the Kniphofia in the garden it was indeed a sight to behold. The Oriole is one of the most beautifully colored birds and just happens to be a perfect color match for the spiky Kniphofia flowers. 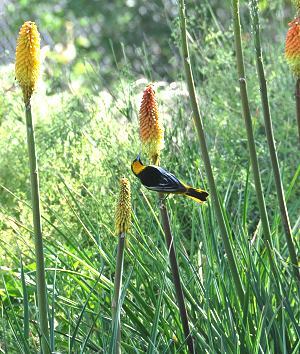 This patch of Kniphofia is now in its sixth year and every year the Orioles visit. It is the only time they are seen here and this is the only plant they have been spotted visiting for any length of time. The nectar must be mighty tasty because the birds work relentlessly to sip from each flower tube. Usually there is never more than one Oriole in the patch at a time. This year though a young Oriole followed an adult into their Garden of Eden. And, there are times when the hummingbirds get pretty possessive of the nectar rich flowers, but no matter how much the little hummers buzz around they cannot run off the Orioles. Kniphofias bloom in early spring and it takes a few blooms before the Orioles show up. In the picture above, it is easy to see the grassy nature of the Kniphofia which adds extra texture and interest to the garden. This patch has self seeded so there are varying color patterns among the flowers but they are all in the yellow to orange range. The flowering spikes can reach 5 feet tall. The bloom right under the bird is shorter because it is newly emerging and smaller because it has not yet unfurled its flowers. 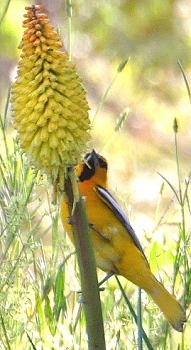 New flower spikes continue to be produced for many months which lengthens the stay of the Oriole. There does not seem to be any advantage to removing spent flower stalks to encourage more bloom. Kniphofia is an African native (mostly South African) that is comprised of a lot of different species. The most common is K. uvaria and its many varieties. True to its temperate heritage, it prefers a slightly drier soil or at least one that drains very well. It does seem to tolerate varying degrees of sun and shade. 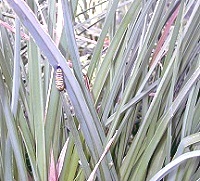 Apparently, these tall, sturdy grass blades looked like an inviting place for this Monarch caterpillar to pupate. Not many insects bother the Kniphofia so when a partially sawed leaf was noticed during the pruning of a neighboring scented geranium further investigation was definitely called for. Not two hours after we spotted our friend, he had disappeared completely into his little case! Red Hot Poker is one of the six plants chosen to be in our Wildlife Herb Garden Six Pack.